Schellenberg was not ignorant of the crimes and mistakes of his comrades and superiors. He was responsible for special counterespionage duties within the Reich Central Security Office, and he eventually inherited part of Heydrich's legacy. He achieved a measure of fame in German intelligence circles in connection with the abduction of two English agents-Best and Stevens-whom he lured across the Dutch border at Venlo in November, 1939. 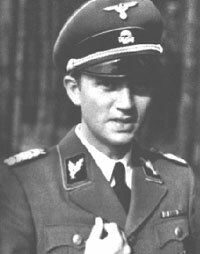 Schellenberg was also engaged in highly dangerous intrigues with Ernst Kaltenbrunner, who was his nominal chief after Heydrich's assassination at Prague in June, 1942, and with his own colleague Heinrich Muller, head of the Gestapo. All three were intent on extending the sphere of influence of their respective departments, increasing their personal power, gaining the ear and confidence of Himmler, protecting their personal friends, destroying their personal enemies, and a thousand things besides. Being in charge of counterespionage, Schellenberg was better informed than most about the political and military situations of overseas powers and their attitudes to Hitler and Himmler. Behind the scenes he fought savage battles to prevent or to mitigate some of the enormities which were known to him. To what extent he was motivated by humanitarian feelings and to what extent by the desire to furnish himself with an alibi for future use, it is difficult to say. At our first meeting such matters were touched upon only lightly. On that occasion Schellenberg clearly wanted only to question me about astrology; he said astrology was in bad repute, and he had serious doubts about many aspects of the subject. "Let us take an example," he said. "Suppose a railway accident is caused by a signalman forgetting to change the points. Now an astrologer will say that the accident was bound to occur at that particular moment because the constellations were such-and-such. I don't see that." I explained that the sequence of events was actually of quite a different order. "In such a case," I said, "what really happens is that a certain constellation, which corresponds to a particular point on the earth's surface, triggers a whole chain of events within the cosmobiological system. A doctor might be inclined to explain the accident in terms of illness on the part of the signalman, while a psychologist, a chemist, or a meteorologist would explain it in other terms. But I explain it in terms of the specific constellation, which constitutes the outer husk of the corporate entity 'microcosm-macrocosm,' in which we are all enveloped. For the astrologer a constellation is simply the celestial counterpart to an event taking place at a specific point on the earth's surface." Schellenberg then raised a further objection. "Astrologers," he argued, "commit a fundamental error. When they cast a horoscope, they base it on the moment of birth, which they regard as the beginning of life. But life really begins at the moment of conception. How do you explain that, Herr Wulff?" This was another question frequently posed by intelligent laymen. "But a horoscope can be cast for any moment in a person's life," I replied. "We choose the moment of birth simply because it is the easiest factor to determine. And anyone will concede that it constitutes an important point in the biological course of a person s life. A horoscope based on this point embraces all earlier points and phases-the moment of conception, the growth of the germ cells in the parents, and even the line of ancestors-and also anticipates all the important biological processes and events which follow the moment of birth." "But the moment of birth can be arbitrarily deferred either by surgical means or by the administration of medicines. It can also be brought on prematurely by an accident," he argued. This is also a well-known objection. I explained that all such circumstances would be indicated in the horoscope by specific constellations and consequently would not be incompatible. The layman finds it all so strange and improbable, I said, because he is unable to see the intermediate links in the chain and because he has a false conception of time and space, one that is now being rectified by modern physics and by Einstein's theory of relativity. "In that case," Schellenberg concluded, "astrology is an extremely interesting precursor of modern scientific thought. And yet it is nevertheless in bad repute." I agreed with him. "The greatest enemies of astrology are astrologers," I said, "or rather the so-called astrologers-that is, the charlatans and newspaper quacks. But there are serious astrologers who are trying to bring the knowledge and the methods of traditional astrology into line with the natural sciences. Atomic physics is a good example." Schellenberg saw the point at once. Then, with characteristic spontaneity, he suddenly posed a question of a quite different kind: "Do you consider that astrology is a suitable vehicle for the propagation of political concepts and for the political control of a nation?" "Certainly," I replied, "it is possible to use astrology in the interests of the state, especially for propaganda purposes. The English did this on a large scale in the First World War. Lord Northcliffe, the famous propagandist, fully appreciated the significance of astrology as a means of influencing the masses. Of course, such practices can easily lead to abuse. It is questionable whether responsible astrologers would subscribe to them. Today our prominent and serious workers in this field have been imprisoned while the butchers and charlatans are allowed to carry on. A few months later Schellenberg summoned me to his office and showed me a small astrological magazine called Der Zenit. Except in one small respect-namely, the addition of Der ("The")-it had the same title as the well-known monthly astrological journal Zenit, which was the official organ of the most important German astrological association until it had ceased publication in 1938. "Here's an interesting publication," Schellenberg said. "It has been smuggled into Germany by sea from Sweden and turned up for the first time at Stettin not long ago. Subsequently we seized a number of wooden cases full of them. Dr. Korsch's name appears as publisher and editor but, as you know, he's been in a concentration camp since l938. * What do you think of it?" *	Korsch was already dead by this time. I skimmed through the bogus Zenit. It contained a good mundane horoscope for 1943, also the horoscopes of Admirals Doenitz and Raeder, plus the horoscopes of a number of German battleships. The latter were erected for the time of launching. I told Schellenberg that from an astrological point of view it was a first-class production and indicated that it was the work of experts. Some very skilful bits of propaganda had been casually inserted in an otherwise apparently innocuous text. We deduced that this fake had been manufactured in England, and I mentioned to Schellenberg that there were some very skilled astrologers there. Years later my friend Ellic Howe told me that he had been involved in the production of this pseudo-Zenit together with Sefton Delmer and the late Louis de Wohl. During my discussion with Schellenberg I told him about the bungled efforts of the Propaganda Ministry and our Foreign Office to use so-called occultism for psychological warfare purposes in France and many other European countries. I mentioned that Dr. Goebbels had been particularly interested in using the obscure rhymed prophecies of Nostradamus, the sixteenth-century French seer, for this purpose. The Nostradamus "campaign" had been waged between the end of 1939 and the autumn of 1940. It had mainly taken the form of sixteen-page booklets containing prophecies selected from Nostradamus by Krafft, the Swiss astrologer. Industrious writers in the Propaganda Ministry processed Krafft's "interpretations" to predict the downfall of the British Empire and the inevitable and total victory of Germany. The clumsy adulteration of the original prophecies and the obvious tendentiousness of the commentaries had been quickly noted in the countries where the pamphlets were distributed. One day the leading English, Swedish, and Spanish newspapers had carried the headline: WHO IS NOSTRADAMUS? A few days later they printed the answer: NOSTRADAMUS IS ADOLF HITLER! Schellenberg was well aware of the spurious methods used by the Propaganda Ministry and the Foreign Office. After all, he himself ran an institute which served as a technical workshop for his espionage department, producing sophisticated forgeries with scientific techniques. We moved on to the discussion of mundane astrology. 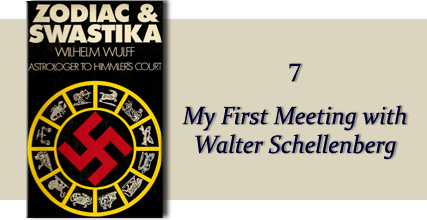 Schellenberg, who was friendly with Kersten, knew that he could speak to me without reserve. He told me in great agitation about his views on the ominous development of the Third Reich and the completely bungled political and military situation. "Hitler ought to be removed, thrown out; only the concept of law can ensure the preservation of peace both at home and abroad. But such concepts are completely alien to him. It is very difficult for me, holding these views, to carry out my official duties in a conscientious manner," Schellenberg concluded. "Unfortunately, Hitler's removal would not change the course of events," I replied. "Far too much has happened for that. I have been studying Hitler's horoscope for twenty years now. I have a pretty clear idea of what is ultimately in store for him. He will probably die under the hand of an assassin, certainly in 'Neptunian'-that is, enigmatic-circumstances, in which a woman will play a leading part. The world will probably never know the precise details of his death, for in Hitler's horoscope Neptune has long been in bad aspect to other planets. Moreover, Neptune is extremely strong in his horoscope, and it was always to be expected that his great military projects would have a dubious outcome. "I have been racking my brains for some time now to see if there was anything that could be done," Schellenberg interposed. "Perhaps the fate of the German people might still be mitigated if it were possible to bring about a change in the government. Do you consider the constellation for Stalin and the Soviet Union to be favorable?" "If the data which I have for Stalin's birth are accurate," I replied, "then he can expect a large number of highly favorable planetary directions in 1945-46. These do not indicate a Soviet defeat. But Stalin's birth data need to be checked. Could you find Stalin's precise time of birth, so that I can check my information?" "I'll see what I can do," Schellenberg replied. "But what about the astrological prospects of Great Britain and the United States?" "Much the same as the Soviet Union's! To put it bluntly, the constellations of these two nations are extremely advantageous right up to 1947. They reach a peak in mid-May, 1945. Action must be taken quickly if Germany is to be spared even greater misfortunes." "Could you draw up a comprehensive report on all these questions for the Reichsführer?" Schellenberg asked. "I have found our conversation extremely illuminating and important both for my own plans and for those of the Reichsführer. I am very grateful to you for your candid account. And you know," he added, "what you told me about my own horoscope was absolutely true."